“Nothing in your house affects your comfort more than your heating and cooling systems. 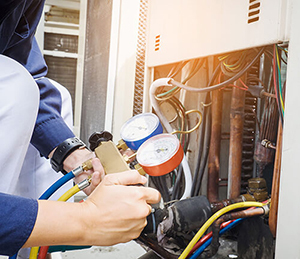 Yet unless the heater conks out during a blizzard or the air-conditioning goes on the fritz in the middle of a heat wave, most of us pretty much ignore our heating, ventilation, and air-conditioning (HVAC) equipment. When not kept in shape, even the best heating/cooling system can cost you by wasting energy. How much? Depending on how you heat and cool your home and the climate of the area you live in, clogged filters, dirty thermostats, sooty flues, leaky ductwork, and unlubricated fan motors can reduce heating and cooling efficiency by up to 25 percent! Cleaning the flue, changing the fuel filter, cleaning and adjusting the fuel jets. Sometimes keeping track of all our heating and cooling equipment in the home can be overwhelming, but that’s why we’re here. Our technicians are available for questions and maintenance, and to help you better understand what you need to keep your systems running smoothly. A great thing to remember: “Arrange for service calls before the start of heating or cooling season. You’ll get better attention and have more flexibility when scheduling the appointment.” Don’t wait! Call Broco now to get ahead of the game, and enjoy a stress free, easy breezy summer.